↑ "Timeline for the History of Jerusalem". Jewish Virtual Library. American-Israeli Cooperative Enterprise. Retrieved 16 April 2007. "In 1967, Tel Aviv was the largest city in Israel. 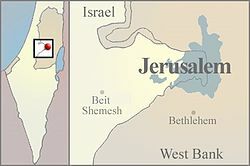 By 1987, more Jews lived in Jerusalem than the total population of Tel Aviv. Jerusalem had become Israel's premier city." (Friedland, Roger and Hecht, Richard. To Rule Jerusalem, University of California Press, 19 September 2000, p. 192. ISBN 0-520-22092-7). ↑ "Press Release: Jerusalem Day" (PDF). Central Bureau of Statistics. 24 May 2006. Retrieved 10 March 2007. ↑ "Jewish Birthrate Exceeds Arab in Jerusalem". Jewishpress.com. Retrieved 2012-12-07. ↑ "TABLE 3. – POPULATION(1) OF LOCALITIES NUMBERING ABOVE 2,000 RESIDENTS AND OTHER RURAL POPULATION ON 31/12/2008" (PDF). Israel Central Bureau of Statistics. Retrieved 26 October 2009.